Description:Adult male purple sandpipers in breeding plumage have heavily streaked necks, breasts and flanks. Their belly and vent are white with streaks of brown on the side. Upperparts are darker. They have brown heads with a blackish-brown crown, mantle and spaculars with chestnut fringes and a white supercilium. Their dull yellow bills curve downwards and have a black tip, eyes are dark brown, and legs and feet are dull yellow. Females look similar to males, except they are bigger, and their bills are longer. Outside of breeding season, adult purple sandpipers have white spots on their necks and breasts and they have a purple gloss on the upperparts. Their heads are dark brown and their feet and legs have a green tinge. Juvenile purple sandpipers look like adults in breeding plumage but they have chestnut fringes on the mantle and foreneck and breast grey-brown with spots. Nesting: Purple sandpipers nest alone. The nest is a shallow hole in tundra moss sometimes lined with plant material. The male prepares up to 5 nest sites and the female chooses one. Purple sandpipers lay 3-4 olive eggs with brown spots, which are incubated by both adults for about 21 days. Chicks are precocial and feed themselves soon after hatching. Usually the female leaves them and they are raised by the male alone until they fledge at 21-24 days. Feeding:Purple sandpipers eat insects and molluscs but in breeding season will supplement their diet with crustaceans, spiders and worms. They will also eat seeds, leaves, berries and buds. Where to see them: Purple sandpipers can be found around the coast of the UK particularly on the north east coast. You can see them near piers, groynes and mussel beds. Did you know? 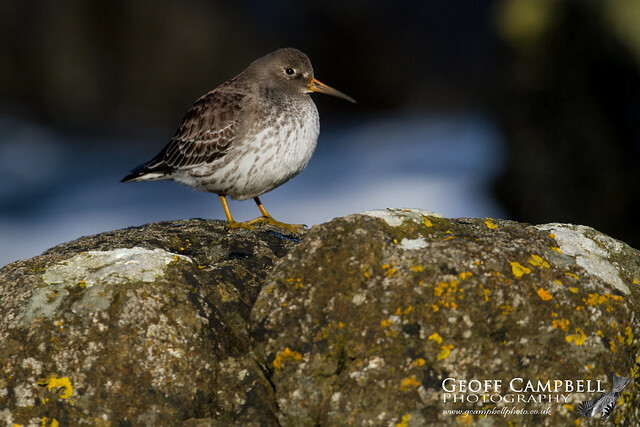 Purple sandpipers have the northernmost winter range of any shorebird.